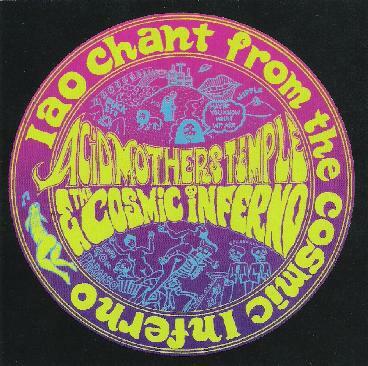 Acid Mothers Temple - "IAO Chant From the Cosmic Inferno"
For a while there, I though AMT were starting to fall into a rut. Everything from them was starting to sound kind of, well, the same. But last year's post Cotton masterpiece Minstrel in the Galaxy was a revelation, being one of their spaciest, far out there cosmic voyages ever, and proved that AMT still had new ideas to offer. But that particular line-up was short lived. In 2005, Kawabata re-tooled the AMT line up and sound once again, taking the new band both on the road and into the studio. And talk about your re-vitalizations! IAO Chant from the Cosmic Inferno consists of just one long (51 minutes) track of pure, mind-melting space rock. With two drummers onboard, the percussion really drives the music this time out. Things get going with some spacey cosmic sludge and weird, echoed chants, but then the band launches into a riff unabashedly borrowed from the classic Gong track IAO Chant/Master Builder (which Gong Alumnus Steve Hillage recycled for his amazing The Glorious OM Riff-hence the title of the AMT piece, which is slightly different from the album title: OM Riff From the Cosmic Inferno). A cosmic inferno is exactly what it sounds like. With pulsing, molten electronics and Kawabata's maniac soloing, the band definitely sets the controls for the heart of the sun here, in a blazing jam of searing hot energy. They leave behind their tendencies to freeform chaos and avant-garde explorations of the past though, this time playing out to a powerful driving rhythm that vigorously propels the music forward through interstellar space. Don't worry, there's a little time to catch your breath in the middle as the music dissolves into a warm and vibrant ambient passage, but before long it's off again with more monstrous jamming and Kawabata's incredibly creative guitar leads, finally coming full circle to that wonderful Gong/Steve Hillage riff again, till it at last echoes off into the distant chants we heard at the beginning. OM Riff From the Cosmic Inferno just zooms by at light speed, seeming to be far shorter than its actual length. It's pure, exhilarating, and glorious space rock all the way, and one of the best albums I've heard from Acid Mothers Temple in their 10-year existence. Most highly recommended! For more information, visit the Acid Mothers Temple web site at: http://www.acidmothers.com.